A still from Episode 1 of "Star Trek: Discovery" on CBS. Warning: This recap includes spoilers for the first two episodes of "Star Trek Discovery." 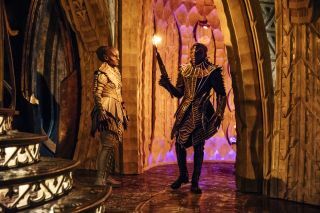 "Star Trek: Discovery" opened on CBS All Access Sunday night (Sept. 24) with a powerful opening shot after 12 years of absence from television. This is not your grandparent's "Star Trek," nor your parents'. It's darker, as Starfleet faces the Klingons for the first time in generations. And as one officer eloquently puts it, "Retreat is not an option." It's Earth in the year 2256, and First Officer Michael Burnham (Sonequa-Martin Green, best known for "The Walking Dead") is just about to get command of her own ship. But circumstances change quickly when Burnham, Capt. Georgiou (Michelle Yeoh, whose notable credits include the James Bond film "Tomorrow Never Dies") and the crew of the USS Shenzhou come across a strange energy signature in a ring field. The action hardly lets up in the intense 2-hour premiere, which throws in a few tropes for longtime "Star Trek" fans. One of the first scenes show Burnham and Georgiou bantering about the Prime Directive, which calls for noninterference with alien species if they are not at a sufficient level of civilization. There are Klingons – speaking almost exclusively in Klingon, which is refreshing – and Vulcans, mostly represented by Spock's father, Sarek (James Frain). And for newer arrivals to the series, there are amazing special effects and plenty of intrigue to keep even novice Starfleet wannabes glued to the screen. Watch for the battle sequences and the views of the ring field. As for action, Burnham quickly violates Starfleet and "Star Trek" protocol by committing mutiny, a move made all the more shocking because she grew up with the logical and loyal Vulcans and is trained in their tradition. This sets the stage for a fun encounter with the Klingons on their own ship, a massive complex that is shrouded by the tombs of dead Klingons attached to the hull. Although Georgiou says she misjudged Burnham's readiness for being a captain, the pair rush over to the ship to try to stop the Klingons. The encounter proves fatal for Georgiou. And Burnham, transported back to safety and racked by grief, is eventually stripped of her rank and thrown into prison for life, at least according to the panel of judges judging her case. This being a "Star Trek" show, we guess that Burnham won't be stuck in a cell for long. But what a powerful opening episode. Instead of a crew staidly following procedure on a ship, we have a renegade first officer working outside the confines of Starfleet. Hints from future episodes promise us a show outside the usual confines of ships, on-screen discussions with foreign species and landings on the occasional planet. Instead, we'll have episodes with prisoners, and with people who are resentful of Starfleet's role in their lives. Welcome back to TV, "Star Trek," and may your series live long and prosper.